If you,ve ever had to cable up an orchestra pit (stand lights, keyboards, mic cables, monitor cables, etc.) you know that it really should be called a snake pit. The only thing that is more challenging than cabling one is troubleshooting something in the dark while your show is going on. 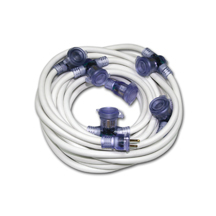 White distributed outlet cables can make this task a little easier. If you use a white distributed outlet cable for power, you can quickly differentiate the power cable from other cables in the mix. Outlets spaced every five feet mean that you can minimize the use of extension cords for music stands, amplifiers and keyboards. Best of all, each outlet is individually lighted, making a snap to plug something in in the dark. 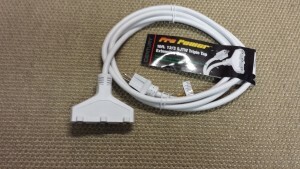 A new product has been added to the line of heavy duty extension cords at WhiteExtensionCord.com. The CTWT10 is a 10 foot version of the popular Pro Power series from Century Wire & Cable. Tent power is a tough job. Getting power where you need it while keeping cables out of traffic patterns and keeping a clean look is always a challenge. Multi outlet cables from Century Wire places outlets every ten feet, giving you an outlet exactly where you need it. Each outlet is lighted to let you know that it is powered and each outlet has a snap on cap to make it weather proof. When you add a tough but flexible jacket and great coilability, you’ve got an extension cord that is made to solve tough prolems.